Today our outstanding Benedictine College class of 2015 graduated, and with that summer begins for us here in Atchison, KS. Just in time for summer, I have a new piece of scholarship to share. 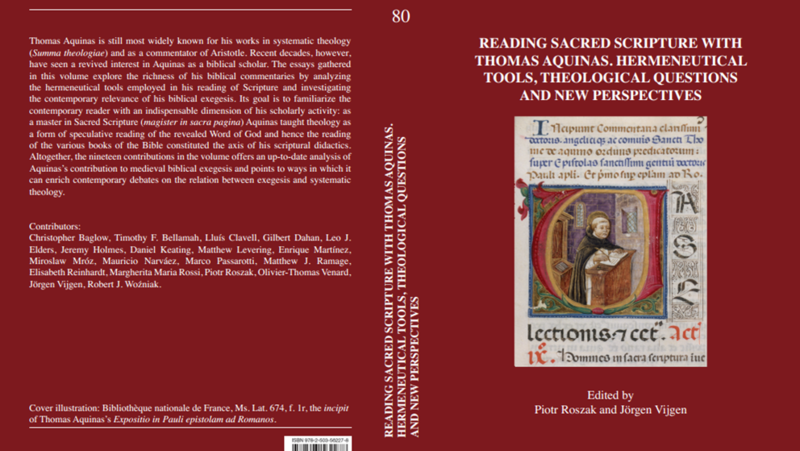 The file I’m attaching here is a chapter I wrote for a book entitled Reading Scripture with Thomas Aquinas, forthcoming later this year. The chapter explores the respective exegetical methods and practices of Thomas Aquinas and Ratzinger/Benedict XVI as applied within the account of primeval history narrated in Genesis 1-3. Before treating commonalities between Aquinas and Ratzinger, I address the latter’s critiques of neo-scholasticism first so as to make it clear that Ratzinger is not strictly speaking a Thomist. With this initial caveat in place, there follows an overview of principles illustrating key points of contact in which Ratzinger implicitly (and explicitly at points) connects his exegetical programme with that of Aquinas. Finally, the core of the chapter consists in illustrating how the shared principles of Aquinas and Ratzinger are applied to specific realities within the biblical text. In sum, I aim to show that Ratzinger conducts his exegesis of Genesis in a way that is much in the spirit of Thomas and indeed shares many parallels with Thomas’ exegesis of the same texts. At the same time, I endeavor to make it clear that Ratzinger makes significant advances beyond Aquinas with the help of the modern scholarly tools to which he is privy. Thus I hope the reader will see that Aquinas’ exegesis continues today to exert its influence and to remain profitable even as it needs to be supplemented by the best scholarship currently available—precisely the view advanced by a leading biblical scholar who was to become bishop of Rome. This entry was posted in Uncategorized and tagged Biblical Exegesis & Interpretation, Evolution, Genesis, International Theological Commission, Pontifical Biblical Commission, Pope Benedict XVI, St. Thomas Aquinas by admin. Bookmark the permalink.